IIFPT Notification is out. 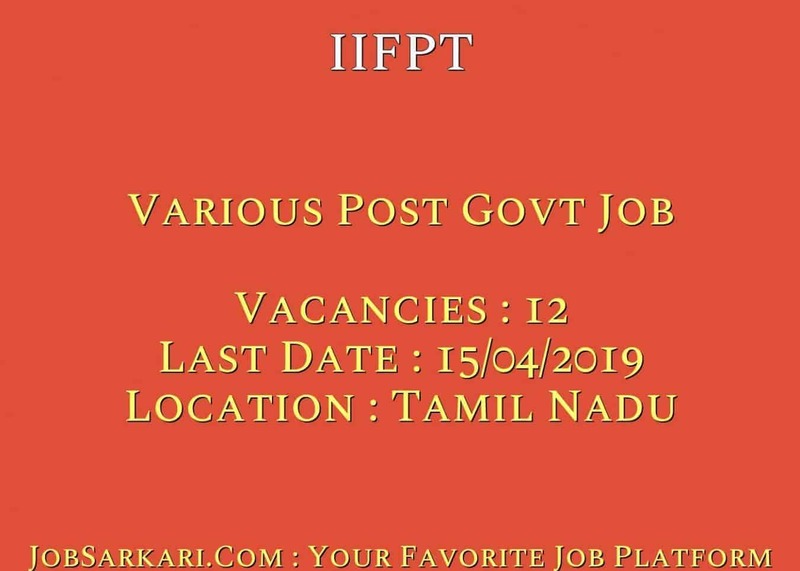 IIFPT is recruiting for 12 Various Post Govt Job Posts. You can check IIFPT - Indian Institute of Food Processing Technology last date, download IIFPT notification, visit IIFPT official website and check other IIFPT Vacancy details.Complete Vacancy and recruitment Details about 12 Various Post Govt Job vacancies in IIFPT are provided below by JobSarkari.Com only for you. Date of Walk in Interview. 15/04/2019. Mode of Payment. Candidate Need to Pay Through Offline Mode. Adjunct Faculty- Food Process Engineering. Candidate Must Have Passed M Tech./ M.Sc./ PhD with specialization in Post Harvest Technology/ Food Technology/ Food Engineering/ Food science/ Food science and Technology/ Food science and Nutrition or Agricultural Engineering/ Chemical Engineering specialized in Food Process Engineering. 02. Physical Education Teacher. Candidate Must Have Passed Master Degree in Physical Education With 55% Marks And Having 1 Year Experience in Related Field. 02. Senior Research Fellow (Active Intelligent Packaging System with Antimicrobial Agents for Fruits and Vegetables). Candidate Must Have Passed M.Tech in Food Process Engineering / Food Science and Technology / Food science & Nutrition / Biotechnology. 01. Senior Research Fellow (Development of non-Dairy Symbiotic food to Ensure Food safety & Combat Hidden hunger Deficiency). Candidate Must Have Passed M.Tech in Food Process Engineering/ Food Science & Technology/ Biotechnology/ Chemical Engineering/ Nanotechnology/ Allied Disciplines or M.Sc. in the above disciplines with NET/SLET or Ph.D in the Related Disciplines. 01. Senior Research Fellow (Development of Sensors for Quality Evaluation Coconut Oil). Candidate Must Have Passed M.Tech in Food Technology/ Food Process Engineering/ Food Science & Technology/ Processing and Food Engineering. 01. Project Assistant (Development of Sensors for Quality Evaluation Coconut Oil). Candidate Must Have Passed Bachelor degree in Food Technology/ Food Process Engineering/ Food Science & Technology/ Electrical Engineering/ Electronics & Instrumentation Engineering/ Electronics and Communication Engineering. 01. Senior Research Fellow (Enzymatic Improvement of Bio Availability of minerals, proteins and soluble Fiber from Millets). Candidate Must Have Passed M.Tech. in Food Process Engineering/ Food Science and Technology/ Nanotechnology/ Biotechnology/ Chemical Engineering or M.Sc. in the Related Disciplines with NET/SLET or Ph.D in the Related Disciplines. 01. Project Assistant (Enzymatic Improvement of Bio Availability of minerals, proteins and soluble Fiber from Millets). Candidate Must Have Passed B.Tech. in Food Process Engineering/ Food Science and Technology/ Nanotechnology/ Biotechnology/ Chemical Engineering or M.Sc. in Food Science and Nutrition/ Biochemistry/ Biotechnology/ Microbiology. 02. Junior Research Fellow (Enabling Start-Ups through value Chain Approach for Under Utilized Crops of Arid Region in Tamil Nadu). Candidate Must Have Passed M.Tech in Food Technology/ Food Process Engineering/ Food Science & Technology/ Biotechnology/ Chemical Engineering. 01. Adjunct Faculty. Max 70 Years. Physical Education Teacher. Max 50 Years. SRF/ JRF/ PA. Max 35 Years For Men And Max 40 Years For Women. 2. Candidate Have to Download Application Form of the Post Applied For As Given on our Website in Important Link Section. 3. Candidate Have to Fill All the Details in Application Form And Need to Attach All Mandatory Documents And Latest Passport Size Photos. 4. Candidate Have to Go on Given Address on 15th April 2019. Indian Institute of Food Processing Technology, Thanjavur - 613 005 (Tamil Nadu). Q. What is the Last Date For IIFPT Various Post Govt Job Vacancy ? A. 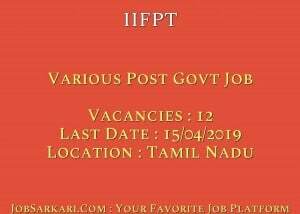 Last Date for IIFPT Various Post Govt Job Posts is 15/04/2019. Q. What is the Form Type of IIFPT Various Post Govt Job Recruitment ? A. The Form Type for IIFPT Various Post Govt Job Posts is Offline. Q. How many vacancies are available in Indian Institute of Food Processing Technology Various Post Govt Job Posts ? A. There are about 10 Vacancies in Indian Institute of Food Processing Technology Various Post Govt Job Posts. Q. What is the Full Form of IIFPT ? A. Full Form of IIFPT is Indian Institute of Food Processing Technology .